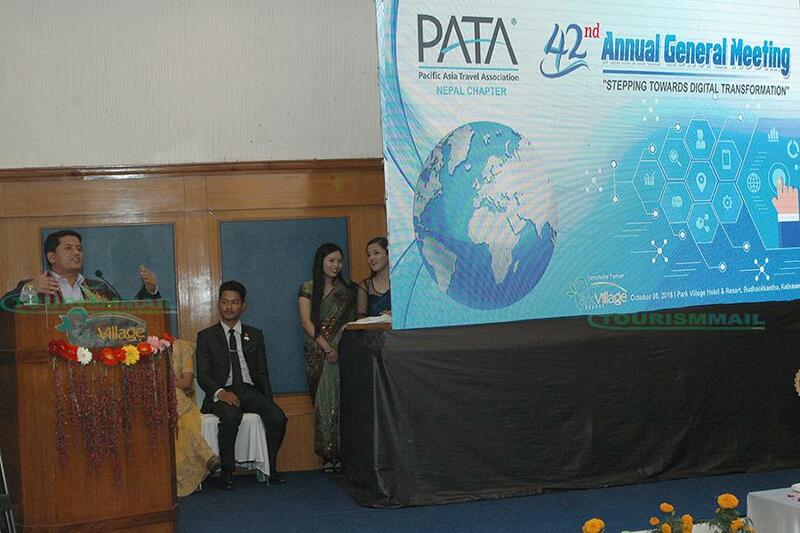 KATHMANDU, Oct 09: Pacific Asia Travel Association (PATA) Nepal conducted its 42nd Annual General Meeting on 8th October 2018, at Park Village Hotel and Resort, Budhanilkantha, Kathmandu which was themed as "Stepping towards Digital Transformation. The annual meeting was inaugurated by Tourism Minister Rabindra Adhikari, Speaking at the event he urged to develop the tourism of our country as an industry." 2020 campaign is a symbol of making changes in the tourism of our country. We all should try to make economic development with the help of tourism by sharing the positive message of our country in international level and also we should maintain the stability in every sector," he said. Development is not the thing that happens overnight that's why we all must have patience within ourselves to create a prosperous society. "Being tourism minister I have lots of responsibility, the Tourism sector is a private company friendly sector and there are lots of tourism entrepreneurs all around and I will always work hard for the development of private sector and for that I need your support," he added. He also acknowledged the great effort of PATA Nepal for making Himalayan Mart 2018 a great success. PATA Nepal Chapter Chairman, Mr. Sunil Sakya during his welcome remarks emphasized on the need for immediate strengthening the National Flag Carrier, Opening of New Air corridor and the necessary Infrastructures along with the establishment of international Convention Center in Kathmandu valley. He proposed government and Nepal Tourism Board to bring back "PATA Adventure Travel Mart" to Nepal in 2020. He said " As we are celebrating Visit Nepal Year in 2020, we believe that the hosting of PATA Adventure Mart once again in 2020 would be a great value-add for the industry and this would add the significant value to meet the target of 2 Million tourists set by the Govt. of Nepal with the Visit Nepal Year 2020." PATA Nepal Chapter on behalf of the Govt. of Nepal and in collaboration with Nepal Tourism Board (later on) had hosted PATA Adventure Travel Mart & Conference in Nepal 6 times in Nepal so far. Likewise, Chairman Association of SME, business owner of China, Marcus Lee also discussed on: How to attract Chinese Tourists, He suggested the government to improve the infrastructures of our country like airport and flights. In the event, the PATA student's chapter also announced the PATA Moto Photo Contest 2018 aiming to explore the unexplored tourism potential of the nation. Mr Jens Thraenhart, CEO/ Executive Director of Mekong Tourism Coordinating Company also expressed his strategies with the focus on Digital Marketing as the Keynote Speaker at the event. Mr Deepak Raj Joshi; Chief Executive officer of NTB, Abdullah Tuncer Kececi, General Manager of Turkish Airlines Nepal, and other Tourism entrepreneurs were present in the event.